The Maria Feodorovna administration dated back to 1797 when the Emperor Paul entrusted his wife with control over the orphanages established by Catherine the Great. The administration expanded its work to include promotion of girls' education and provision of institutions for the blind and deaf. It was funded by charitable donations but also by the Theatre Tax, the profits of a factory producing playing cards and a tax on Playing Cards. Above is an image of a Playing Card tax label for 30 kopecks. 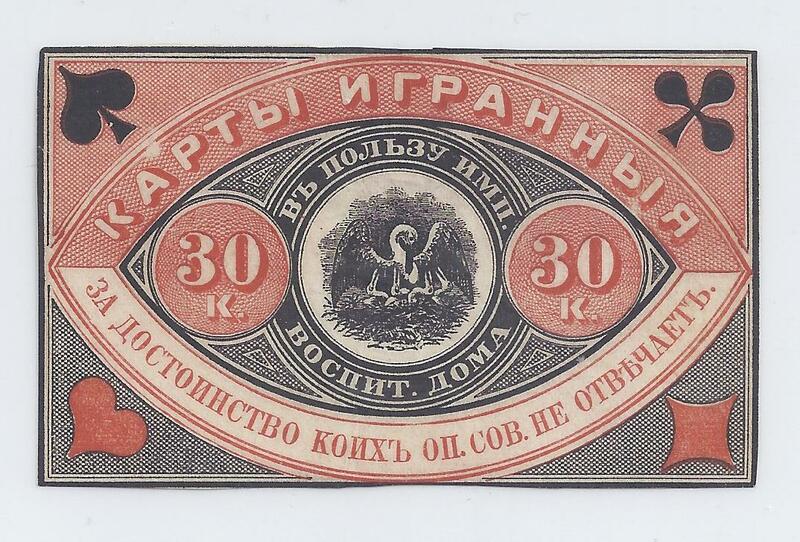 This label is very scarce but quite well known and it has been reproduced on the Internet - for example, by John McMahon at russianrevenuestamps.com. McMahon dates them to 1892 onwards. Mentioned but not illustrated in John Barefoot's Russia Revenues catalogue are the orange and black banderoles used to seal packs of playing cards and illustrated here (I think for the first time on the Internet). The Barefoot catalogue is almost useless except for the section on tobacco and other banderoles which is based on the collection of the late Steve Alushin. 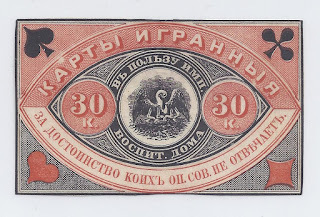 All these banderoles, like cigar and cigarette tax bands, are printed on the thinnest of cigarette paper (or "Bible paper") and the fine quality engraved printing was done by the Imperial State Printing Works in St Petersburg.